The International Space Station is expected to keep on offering what we know the best entry we can have to what life off-Earth is overall like, and this will keep on happening as long as we consider Interstellar as part of science fiction. Chris Hadfield's famous Bowie rendition has clearly demonstrated as to how the crews of international astronauts who have lived in the space station has always tried their best to convey the overall experience of living in space to the people of Earth and that too making sure that they don’t need rocket power to get the feel of the experience. A person doesn’t need to literally leave their bond with the gravity to understand the life of the astronauts in space. So what is the clip all about? NASA astronaut Don Pettit shot footage of the International space station in the year 2012 using a 3D camera. The footage can be accessed at This video gives the viewers a floating tour of the of the confined interiors of the International Space Station but if see the footage closely one of the most exciting part to see is when Don Pettit has directed the camera to capture the views of the Russian Soyuz capsule docked just above the International Space Station. But in the recent times, what can be considered as one of the most insane video clips that has been posted online is the clip posted from the astronauts' adventures in the microgravity 3D cinematography. This video highlights the behavior of water aboard the International Space Station. The video shows how the team was able to create a softball-size sphere of water due to the surface tension in space. The team took the advantage of this tension which basically makes the water form a ball rather than bead up, as it is bound to do on a non-permeable surface on Earth. After forming the ball, the team has inserted as the GoPro camera inside and taken the outside view from inside the ball. 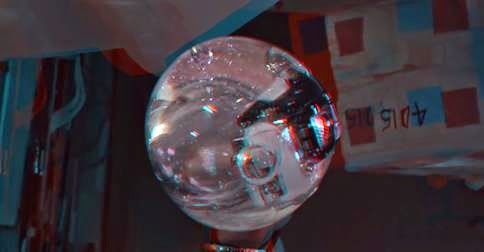 Although the released clip requires a person to wear red-blue stereoscopic 3D vision glasses, but a 2D version is easily available in YouTube as part of pair of clips released by NASA. Who is part of the clip? The video clearly highlights the fun astronauts at NASA had while shooting, and adds an extra dimension in the lives of the people living in the space. NASA astronauts Reid Wiseman and Steve Swanson and Alexander Gerst (European Space Agency astronaut) feature in this video clip.